Today on Serious Grape: Which US Wine Region Will Be the Next Big Thing? I asked this question on Twitter last week and got a surprising range of responses. Everyone had their picks, from Santa Clara to Lodi, from the Finger Lakes to Virginia. Even Canada wanted in on the question, and pointed out that the Okanagan region was very promising. That the next big wine region may be the one just outside your own door. You can read all about it, and some of my recent experiences with wines from Long Island, on Serious Grape (my weekly Serious Eats column). Right now US wine-making efforts outside of California, Oregon, and Washington are largely regional in their reach to consumers. But if we all were to support our local wineries, they just may become the next big thing. I would certainly drink more Long Island wine if I could find it in my wine stores. What are your picks for up-and-coming North American wine regions? Leave your thoughts here or over on Serious Grape. We had four participants in this month's wine book club--the first of 2009--and one review that was written by a wine blogger a few years ago but I'm including it anyway because it's a great review! Except for me, people weren't all that enthusiastic about the book. I was wildly enthusiastic--but then again, I picked the book. 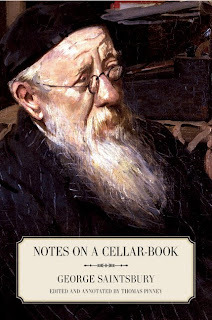 Here are what wine bloggers thought of George Saintsbury's Notes on a Cellar Book. Jim Eastman from Music & Wine found there were language barriers standing between him and Saintsbury, but more importantly "I just didn't find his anecdotes terribly entertaining." Eastman preferred the chapters devoted to spirits, especially whiskies. Kori at the WinePeeps wrote a review that was very much in line with Jim Eastman's. Like Jim, Kori found the language inaccessible and had to "keep a dictionary at my side" to clarify some of his terms. She recommends this book to "an academic or a history buff" (guilty!) She enjoyed the book but she does "wonder if it fits the palate of most of our readers." Frank from Drink What You Like was struck by the picture on the cover and its resemblance to Dumbledore. He, too, found it "tough to read" and he found it "difficult to stay engaged." Though he praises the historical information found within, he doesn't recommend the book as a "general learning tool" for those starting out on wine. Edward the Wino Sapien found "the freshness and directness of the words and familiarity of the names potentially disconcerting," and found that despite its age "many of the words and ideas still hold true." RJH from RJ's Wine Blog didn't like the book AT ALL. She was taken back to English Lit classes--and not in a good way. "Don't buy or read this one. Too heavy, allusive and not all that interesting," RJ said in conclusion. I think these reviews will be quite helpful for people who are thinking about this book and wondering whether they will like it or not. If you're a history buff (or as I suggested a Masterpiece Theater buff) you will probably like this book. If not, then you might want to think twice. Next month's book also has a historical bent, but it covers a bubbly topic, so hopeful it will be a bit easier to get through. I'll have full details and explain why I picked the title next Thursday. Thanks to all the participants for their honest, well-written reviews. And I hope that more wine bloggers and readers jump on the bandwagon next month. For those of you who have never heard of umami, it's the fifth taste. In addition to sweet, salty, sour, and bitter we have umami--a savory taste intensifier that is the un-namable thing in many foods that makes us say "yum" and go back for seconds. Parmesan cheese is inherently rich in umami. So is soy sauce. I'm not sure I've ever tasted it in a wine before now. 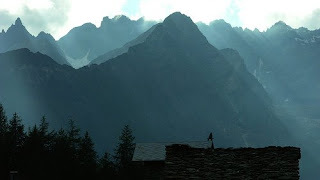 But with my latest foray into the wines of the Valle d'Aosta I took a sip of a red wine and knew that what I was tasting was hit of umami reminiscent of soy sauce. The 2006 Les Cretes Tourrette cost a bit more than my usual wine. It was $27.99 from K & L Wines. Even at that price this was a very good QPR wine because it was so different, so memorable, and so darn good. 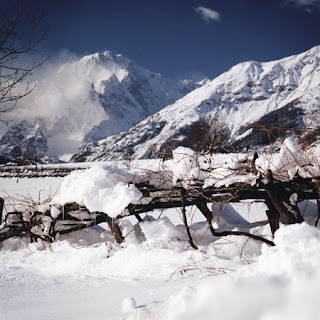 As I told you when I announced that January was devoted to the Alpine Valle d'Aosta, it's hard to find wine from this region of Italy. That's a shame, based on my tastings, because the wines are very distinctive. Made from Petit Rouge, a grape grown only in the Valle d'Aosta, I loved this wine's aromas of cherries, thyme, and crushed rocks. There were flavors of cherries and raspberries, too, along with this marvelously savory, soy sauce note. The aftertaste was juicy, and the wine was lighter in body like a Gamay. If I had to describe it to someone, I'd say it's a Gamay with with a dark side, since the thing about Gamay wines is that they are so bright and lively. This wine had all the brightness, but it was coupled with his great depth and complexity. I had the best intentions of making a traditional Valle d'Aosta dish to go with this wine but in the end we had Rachael Ray's "deconstructed lasagna"--a house favorite for hitting all the flavor notes of the famous baked pasta dish without all the headache and planning ahead. The browned sirloin and parmesan cheese used in the dish really helped to pick out the umami in the wine, and the bright fruit flavors were a nice complement to the tomato sauce. Has anyone else out there had a Torrette made from Petit Rouge? I'd be interested to know if you tasted that same, savory note. Between 1884 and 1915 an English literature professor named George Saintsbury kept a series of notes on his wine, spirits, beer, and culinary adventures. First published in 1920, just as the United States was entering its experiment with alcoholic abstinence, his "cellar book" (as the notebook was called) was such a success it went through three editions in its first year of publication. Young American readers confessed to being so moved upon reading it that they immediately broke the law, drank Port, and toasted the author's health. Since that time it has earned its place many times over as a classic example of wine writing. That's why it made it to the top of the list for the 2009 Wine Book Club, and was my selection for the month of January. Thomas Pinney thought that it was time for a modern, annotated reprint of the book--and as far as I'm concerned he was absolutely right. Now we can all have a copy of this wonderful, evocative book on the shelf, complete with notes to explain the more historical bits. One 0f the things that makes this book a wonderful read is that Saintsbury had a wide-ranging interest in and curiosity about wine. That means he liked Burgundy as well as Claret from Bordeaux, and appreciated beer as much as vintage Port. The other thing that makes it wonderful is that it reads a bit like an episode of Masterpiece Theater--it's terribly British in its strong opinions. And so icing wine is politely but firmly designated as "barbarous." The size of the wine glass matters to the taste of the wine--or so Saintsbury believed, well before Riedel glases. And if you are going to have a special dinner, start with Sherry, move through Champagne to Claret then to Burgundy (DRC 1858 if you can get it...) and finish up with a Hermitage from the Rhone. It came as a surprise to me that there was a concern about "big" wine even in 1923. "Once upon a time there was an author who though not a vintner wrote about wine, "Saintsbury reported, "and some of the experts found...fault with him as with one who leant too much to "bigness," "stoutness," and the like...." The offending wine was French Bordeaux--long before Parkerization--and the author was Saintsbury himself. "If you want delicacy," Saintsbury advises, "you don't go to the Rhone or anywhere in France below Gascony." What's more, Saintsbury thinks that people who refuse ever to drink a light wine, or to touch a heavy wine, are "irregular." Instead, someone truly interested in wine should drink whatever they can. I love this book, and I love Saintsbury's writerly voice. He's curmudgeonly and opinionated but he is in no way narrow in his approach to drink. As such, he's an example to every wine drinker and writer in the 21st century. GWU$20 drinkers may wonder if reading about fantastic bottles of wine from the 19th and early 20th centuries has any relevance to those of us looking for good, affordable, everyday wine. Saintsbury would say yes--and I would agree. For Saintsbury, what matters is that you drink as widely and well as your bank account allows and to learn the differences between wine without becoming a snob about it. Here's what he says: "Here, as else- and every-where in criticism, not only the hardest thing to attain but also the hardest thing to get recognized when attained, is the appreciation of difference [in wine] without insisting on superiority." 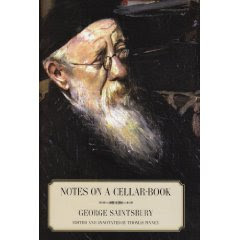 If this taste of George Saintsbury's Notes on a Cellar Book has wet your whistle, you can get the book from the University of California Press ($29.95) or from your favorite book retailer. I'll post a roundup of any reviews of the book written by wine bloggers on Thursday, so send in your links if you participated in this month's club. The February title will be announced next week. I just had a wine that has to qualify as being made under extreme conditions. The grapes were grown in the highest vineyards in Europe--not a highest vineyard, THE highest vineyard. How high? It's in the shadow of Mount Blanc, in Italy's Valle d'Aosta region, and the grapes are planted up to 4000 ft. above sea level. What grapes can survive in conditions such as those pictured on the left? 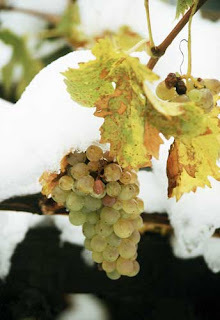 Prie Blanc, an early- ripening grape that is native to the region. Growers plant the vines on low pergolas (pergola bassa) that keep the vines from getting too damaged in all that wind. These are hardy vines--they'd have to be--with an average age of 60 years. And what hardy souls actually want to grow grapes in such a place? 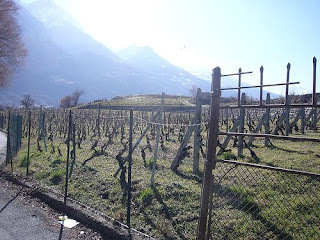 La Cave du Vin Blanc de Morgex et de La Salle is a co-op established in 1983 that includes more than 90 growers who produce fruit under the direction of Gianluca Telloli. They have an excellent website for those of you who know French or Italian--the English portion of the site is still under construction. I had the 2006 La Cave du Vin Blanc de Morgex et de La Salle "Rayon" white wine which was stupendous markdown from K & L Wines for $4.99 a bottle (regular price: $17.99; find it online for $7-$21). Not surprisingly they've sold out of the wine in the 3 weeks since I placed my order. Now I'm on the lookout for the 2007 vintage. It was an intriguing white with its canary yellow color, heavy mouthfeel, and faint aromas of lemon. The flavors reminded me of pear and citrus, and there were mineral, rocky notes in the aftertaste. Very good QPR if you pay more than $10 for it, excellent QPR if you scored it for $5 (like I did). Pair your La Cave du Vin "Rayon" with anything that's made with cheese (like risotto or fondue), shellfish, or chicken roasted with lemon and herbs. All of these foods will be excellent with the pear and citrus notes in the wine. In this week's entry I explain why adopting a varied diet, including advanced fruits like gooseberries and currants, is actually the best way to get more tasting pleasure out of your wine. It's all about the analogies you can make between the flavors in the glass and other flavors that exist outside it. Check it out and let me know what you think. Do you agree that people who are foodies tend to be more sophisticated wine tasters as well? This week, how about putting some soup on the stove and chilling down a zesty Sauvignon Blanc to go with it? The pairing I suggest below makes an elegant, far-from-ordinary pot of warming soup that is perfect if your plans include sitting alone in front of the TV watching The Daily Show on TiVO. Because it's a pot of soup, it will feed as many as six. If you're on your own, make the whole pot anyway. You can have it for lunch over the weekend which gives you one less thing to do. The Recipe: We loved this hearty fennel and zucchini soup with its slices of sausage and crunchy, cheesey Gouda croutons on top. If you are a vegetarian, it would be quite simple to omit the sausage and substitute vegetable stock. It has a gloriously green color (as long as you don't brown the onions--be careful!) that will remind you in the dead of winter that spring really will come back one day. The flavors are rich and nutty, and though the soup doesn't call for any cream its texture is luscious. 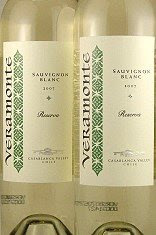 The Wine: For a wine that is as spring-like as the soup, try the 2008 Veramonte Reserva Sauvignon Blanc from Chile. This is a new release, and should be available near you for between $8 and $12. Like previous vintages, this is a reliably excellent QPR pick. A bit less intense than last year's vintage, the 2008 had aromas of gooseberry and pink grapefruit. The flavors pick up a richer note of crushed pineapple, which makes for a juicy wine with a mouthwatering aftertaste that will go well with the hearty but green soup described above. My friends all make fun of me because I have two classifications of fruit: regular fruit (apples, oranges, bananas, strawberries--the fruits suburban children in the 70s grew up with), and advanced fruit (pretty much everything else). I don't know why, but fruit just is not my thing. I am pretty sure I didn't taste a cherry (minus Maraschinos in cocktails and on ice cream) until I was over 30. And yes, this does in fact mean I am not a fan of pie. When I got into wine, I had to start tasting advanced fruit--star fruit, litchis, gooseberries, currants, plums. When it comes to wine, I think Cabernet Franc qualifies as advanced fruit. After the holidays, when I've had my fill of rich foods and rich wines I find myself gravitating towards Cabernet Franc. It's like a tune-up for your palate. And, a great Cabernet Franc can be a challenging and rewarding wine to drink because it doesn't taste like apples or strawberry jam. Instead, it tastes like some green and red mix of herbs, fruit, and spices. This year's advanced fruit selection came in the form of the 2006 Clos Saint-Fiacre. ($13.73, Garagiste; I can't seem to find any retailers who stock it) Made with 100% Cabernet Franc, the wine had aromas of cherry and chalk accompanied by hints of green pepper. A satiny texture made the flavors of cherries, stony minerals, and green herbs slide down your throat without any problem. Unlike some Cabernet Francs, which can be a bit aggressive in the green pepper department, this one had a lovely balance between the herbal, fruit, and mineral notes, and I thought it represented excellent QPR as a result. I had to get on Twitter and ask for food recommendations for this wine, since not everybody likes mushrooms at my house and that's one of the best pairings for Cabernet Franc. Jill from domaine547 said "anything with rosemary," so I took a pork tenderloin, rubbed mustard and brown sugar on it, and then rolled it in rosemary and thyme. I roasted it in a 350-degree oven for about 30 minutes after searing it in a cast iron fry pan on the stove, and served it along with some wild rice and green beans. All the flavors--the mustard, the rosemary (thanks, Jill! ), the green beans, and the earthy rice--went perfectly with the wine. I finished the meal feeling like my tastebuds had been given a workout with some advanced fruit and that I was ready for whatever the new year brings. As regular readers know, I love getting acquainted with new grape varieties. So when a dear friend gave me a bottle of Romanian wine made with Fetească Neagră grapes I was doubly thrilled. 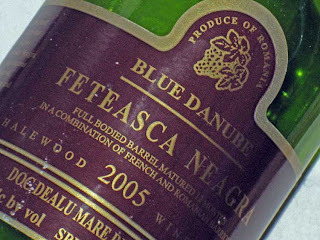 I've never had a Romanian wine, and never even heard of Fetească Neagră. I hit the books to learn more. Romania is at the crossroads of Europe, and they've been growing grapes there for more than 6000 years. As you might expect from a place with that much wine-making and grape-growing history, wine plays an important part in the area's culture. Romanian wine production went through a major transformation in the 1990s when it was privatized following decades of communist control. 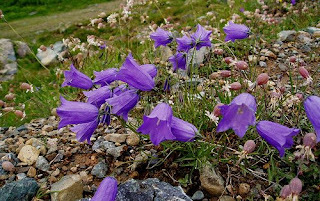 Western investment poured in, because Romanian wine regions--which are at the same latitude as the vineyards of France--have enormous potential thanks to the combination of mountain and maritime influences. Romanian wine lovers prefer white wines to red wines, but among the reds there are all kinds of varietal discoveries to be made like Roşioară, Babească, and the variety I tried--Fetească Neagră. According to the Oxford Companion to Wine, only 1300 ha of the grape are planted, and the wines produced from it are considered to be age-worthy. Book learning is great, but when it comes to wine there's a better way to get to know a grape--so I popped the cork. The 2005 Cramele Halewood Blue Danube was a glorious bottle that reminded me of a red wine poised between a silky Pinot Noir and a rich French Cabernet Sauvignon. The grapes were grown on the south-facing slopes of the Carpathian mountains in the Dealu Mare region which is known for its high-quality red wines. There were shy aromas of pure cassis and some thyme with a whisp of woodsmoke. In the flavors, I tasted cherry, cassis, and a slightly smoky aftertaste. The sparkling acidity at the core of this wine is in terrific balance with the fruit, and made it disappear all too quickly at our house along with a Sunday meal of roasted meat and vegetables. Excellent QPR for a wine that costs less than $12. There may not be a lot of Romanian wine on your local wine shelves, but if you're curious you can find a bottle of this wine for between $10 and $12 from these retailers. And of course, you might want to ask your favorite store to get some in stock and expand their wine horizons, too. If you like it as much as I did, I'm confident this won't be the last bottle of Romanian wine you try! Finding a white wine versatile enough to qualify as a house white can be oddly difficult. Some white wines are too sharp. Some white wines are too flabby. Some white wines are too darn expensive. The 2006 Telmo Rodriguez Basa, on the other hand, is just right. As such, it's an excellent QPR Spanish contender for your house white. ($11.99, domaine547; available elsewhere for the same price). Made from biodynamically farmed grapes, it has zesty flavors, and a heavier moutfheel than most zingy white wines. There are lime zest and litchi-fruit aromas, which are subtle until it warms up in the glass. Waxy flavors of Meyer lemon, golden delicious apple, candied lemon peel, and lime round out the experience of this delicious white wine made from a blend of Verdejo, Viura, and Sauvignon Blanc. Versatile enough to go with everything from chicken and feta tostadas (a Greek twist on a Mexican classic) to chicken with lemon and olives, this is a wine that will be welcome on almost any table. Most of you are freezing. If this is the case, you don't want to know what the weather's like in Southern California. Chilly temperatures call for a warm wine, and for my money the best bets are often red blends. Versatile, tasty, and affordable, today's red blends can be made virtually anywhere, and include varieties such as Zinfandel as well as the traditional Cabernet Sauvignon, Merlot, and Cabernet Franc. Red blends--they're not just for Bordeaux anymore. If you want some particular recommendations, head over to Serious Grape, my weekly column on Serious Eats. You'll find a list of red blends I've tasted recently that cost between $7 and $26 in most markets. This week's Friday Nights IN suggestion is to have a crowd over and cook a hearty, soothing, flavorful meal inspired by the cuisine of the Basque region with an opulent wine from Argentina. How many is a crowd? Well, that depends on you, but the recipes below feed 10 people. With that many people heading over, why not let other guests bring the salad, the dessert, the appetizers, and some bread? Of course, you can always half the recipe. I did, and it worked just fine! The estimated cost for this main dish? $43. 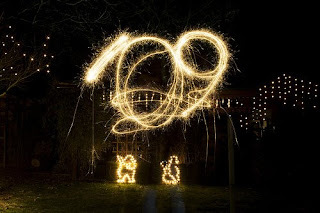 For ten people. Try to get that much bang for your buck in a restaurant. The Recipe: a Basque-inspired dish of tender chicken braised in a piperade sauce, served alongside some homemade steak fries tossed with Spanish smoked pimenton? Food & Wine featured this recipe in their January 2009 issue. This is an absolutely delicious meal that tastes like restaurant food and is easy and inexpensive to make. In our house, it won the highest recipe rating, "repeater," which is reserved for those meals that we would be happy to see over and over again. The Wine: with such a flavorful meal, you want a flavorful wine. I'd suggest the very good QPR 2007 Clos de los Siete by Michael Rolland (available for $12-$20). This wine is still a bit young, so I'd open it and pour it in the glasses about 30 minutes before you sit down to dinner to make the most of its plummy aromas and flavors. In addition to the plums, expect to smell some licorice. The treats continue in the flavors, where raisin and fig notes complement the opulent plumminess of the wine. This wine is blended from Malbec, Merlot, Cabernet Sauvignon, and Syrah grapes and takes much more complex than its price tag would suggest. With ten people coming over, you will want to buy at least two bottles (that's one glass per person), and increase it from there if you want to pour second glasses. Welcome to the 53rd Wine Blogging Wednesday, the online tasting event started years and years ago by Lenn Thompson of Lenndevours. Today, our host is el Jefe, one of the fertile brains behind Twisted Oak Winery. As those of you who know Twisted Oak might imagine, el Jefe picked a theme that was unusual: what dry red or white wine goes with breakfast? I just couldn't imagine dry wine and French toast, pancakes, or anything else sweet. So I though about eggs--specifically a healthy goat chesse and red pepper frittata. And, I thought about one of my favorite brunchy-items that is NOT exactly healthfood but sure is delicious: ooey-gooey-cheesey-savory Welsh rabbit. What wine, I wondered, would go with these breakfast foods? Sauvignon Blanc was the answer. So I popped open the 2006 Sean Minor Wines Four Bears Sauvignon Blanc from the Dry Creek Valley (available from the winery for $14; available from other merchants for around $15). Sean Minor and his wife Nicole named their wines in honor of their four energetic children (or at least they look energetic in the pictures!). They source their grapes from top-notch producers and sell it for affordable prices--which makes them a label to watch out for if you are a GWU$20 reader. The 2006 Sauvignon Blanc impressed me with its excellent QPR. Delicious aromas of pink grapefruit and star fruit give way to a refreshing yet still round palate of fresh figs and lime zest. It was a very well-made, unusually complex domestic Sauvignon Blanc that will please anyone looking for a wine that is fresh without being assertive or acidic. And it went just great with "breakfast," too. So if you are serving something cheesy or eggy, with plenty of savory notes, this wine would be a perfect partner for it. Thanks to el Jefe for a WBW theme almost as twisted as he is! See you back here next month for WBW #54. In case any readers want to follow along, here's an alphabetical list of the wine resources I've found on the web. 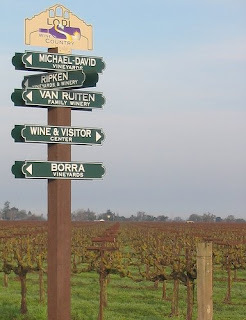 Happy surfing--and join me in exploring this US wine region over the coming months. Go Taste Wine's Washington Wine Country Map: a clickable map with all the major regions. MikeL's Guide to Washington Wineries: easily navigable site, with maps, wine tour itineraries, and an alphabetical list of all wineries in the state. Through the Walla Walla Grape Vine: Catie the Wild Walla Walla Wine Woman's blog, with reviews and wine happenings. Washington Wine Commission: a great guide to Washington state's wineries, grape growers, and wine regions. Perfect for relative newbies (like me). Washington Wine Country: another site with tour itineraries, a guide to regions, and more. Washington Wine Report: this blog was recommended to me by a reader, Domino, and I am glad they left a comment! This is a terrific blog, and writer Sean Sullivan provides focused, thoughtful reviews. Wild Walla Walla Wine Woman: an online wine shop specializing in Washington state wines. Wine Peeps: The Seattle-based daughter and father duo Kori and John give Washington wine terrific coverage. One of their latest articles focused on the best wine shops in the state. 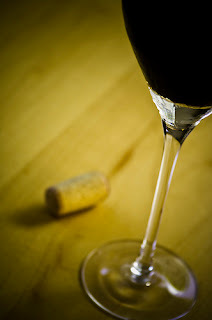 A frequent stop of mine, Wine Peeps is one of the best-informed and thorough wine blogs on the 'net. If you haven't checked it out, you should! They also pay particular attention for wines that deliver bang for the buck, so GWU$20 readers will find a lot to like. 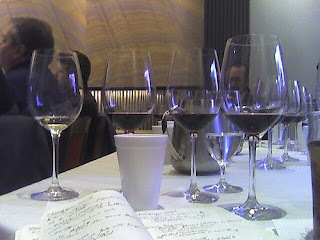 Write for Wine...Washington Wine Wench: a blog dedicated to Washington wine and wine happenings. If you have any other recommended Washington State Wine Resources that I've missed, please leave them in the comments below. I love Petite Sirah--especially the big, luscious kind produced in California, with their fruity aromas and flavors of notes of chocolate and coffee. Unfortunately many Petite Sirahs come with a hefty price tag--at least the ones that are worth drinking do. 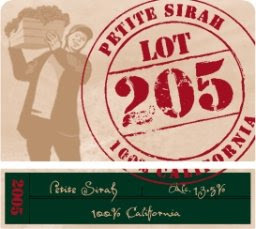 I was thrilled, therefore, to find the 2005 Lot 205 Petite Sirah from Cartlidge & Brown. It's a very good QPR option if you like Petite Sirah but often find the cost is a bit too high for comfort. Available for between $9 and $12, this wine had jammy aromas of raspberry and blueberry compote. The palate was a touch leaner, with flavors of forest fruits and spices. The aftertaste had hints of mocha, which made this wine far above the norm when it comes to budget Petite Sirahs. As an added plus, this wine was lower in alcohol than many Petite Sirahs at 13.5% alc/vol. This tasty, accessible wine would be perfect with any soup or stew. We had it with a triple-red pork stew, the official name of which is Ragout Prebonata. Pork and red wine, slowly cooked in the oven, was combined with a tomato and garlic sauce and sauteed red peppers cooked in a red wine reduction. It was delicious with this hearty red. Are you in a wine rut? Are you so deep in your wine rut you don't even realize it? If you fear you are in a wine rut, head over to today's Serious Grape column, my weekly contribution to the food blog Serious Eats, and check out my three suggestions so that you can make sure 2009 is not only a new year--it's a new wine year, too. Pick one suggestion, and make it your New Year's wine resolution. While we're at it--anyone want to confess that they're in a wine rut? If so, leave your thoughts in the comments section below. My parents didn't have a lot of spare cash when I was growing up, but they had a tradition that I think has a place in today's economic climate: Friday Nights IN. Every Friday, Mom and Dad lit candles, made a special dinner, uncorked some wine and enjoyed a quiet moment at the end of the week. I don't remember eating out when I was a kid, but I do remember these Friday night rituals. Today I'm starting a new feature on Good Wine Under $20 that gives you a food and wine pairing for tomorrow night--or some Friday night in the future. Some suggestions will be for romantic dinners for two. Others will be for solo dining on nights when you convince your partner to cover basketball/ballet/etc. and get some precious time to yourself. Others will be for meals large enough to invite a few friends over, or to have a special meal with your kids. This week I'm advocating a meal of Syrah and Macaroni and Cheese. It's perfect winter comfort food. The Recipe: My favorite mac and cheese is from Food & Wine and has two kinds of cheese and buttery crumbs on top. I got this recipe from fellow wine blogger John at Brim to the Dregs, and he suggested (and I concur) that using whole milk makes for a plenty rich dish. The recipe makes 6 generous servings. Combine it with a salad and perhaps some fruit or sorbet for dessert and you have yourself a meal worthy of company. The Wine: Syrah is made for mac and cheese. 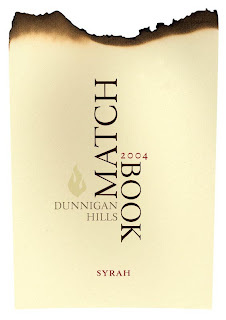 I recommend looking for one with good acidity to cut through the richness of the meal, like the excellent QPR 2005 Matchbook Syrah from Crew Wines (sample; available for $13-$17). The vintage pictured is 2004, but we had the 2005. The wine had delicious, mouthwatering aromas of blackberry touched with green pepper and herbs (thanks to the 11% Cabernet Sauvignon blended in). Flavors of cherry, pomegranate, and cranberry have a lot of lift and brightness and the wine has a very spicy aftertaste. This is an unusually complex example of Syrah for this price point, and will please you and any friends or family you invite to stop on by for dinner. You don't have to go out to a fancy meal to enjoy a well-earned Friday night treat. Why not start a tradition of Friday Nights IN? When the economy revives, you may find this is one cost-cutting measure that sticks. Who Put Nectarines in the Chardonnay? 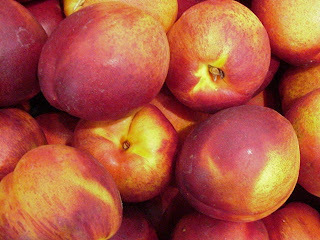 There are times when you read tasting notes and think, "yeah, sure you taste nectarines" and wonder if the wine writer has lost their mind. This is not that kind of wine. If you get a chance to taste the very good QPR 2007 Dancing Bull Chardonnay I am betting that you will also be struck by the unusually pronounced nectarine flavors. First, you well detect aromas of golden delicious apples and grapefruit zest. Then, with the first sip, all you can taste is nectarines, nectarines and more nectarines. Those of you with sharp taste buds may also pick up some peach and apple notes, along with a vanilla aftertaste that remains fresh and light. This would be delightful with slightly spicy Thai food--anything from beef satay to chicken with ginger and oyster sauce. It's a new release, so expect to see it soon near you for $7-$12. I had some trouble getting my hands on wine from this part of Italy, but I've managed to find both a red (more than $20, I'm afraid) and a white (less than $5, I am happy to report--but it was on sale). If you have had any experiences with Valle d'Aosta wine or food, I hope you'll share them in the comments. I know, I know. I'm supposed to be moving on from Tuscany. But I have to tell you about this wine first. It's a find, because of its great flavor profile. It's a steal, since it is available for $18-$20. It's drinkable now, but I suspect it will continue to improve and develop over the next 1-3 years, so it's appropriate for short-term cellaring. 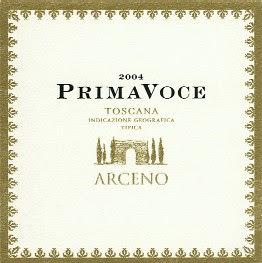 The 2004 Tenuta di Arceno PrimaVoce is an excellent QPR Italian red. It claims to be a "Baby Super Tuscan," but this is one baby that outclasses many of its higher-priced big brothers. Made from 85% Merlot and 15% Cab, this wine exhibited expressive plum and cassis aromas that were juicy without being over the top. The flavors were restrained, with currants, bitter herbs, and blackberry. What I loved most, though, was its black tea aftertaste. This will go with any traditional Italian fare, with grilled or roasted meats and chicken, and I can tell you from experience it is delicious with a plateful of salumi and some cheese before dinner. There are some changes in store for the 2009 Wine Book Club. We started out on a promising note last year, but by year's end participation had dwindled to a few die-hards, and even I was having a hard time keeping the calendar straight. So, this year I will announce a new title for the WBC on the first Thursday of every month, and explain why I think it's a great book. If you want to read the book and post a review on your blog, you can do it whenever you feel like that month. Send me a note with the URL and I'll post a roundup on the last Thursday of every month. There won't be guest hosts, or "spin the bottle" reviews. I hope, instead, that the flexibility will encourage more people to participate. And, I hope that doing it monthly (instead of every other month) will keep the WBC on more people's to-do lists. January is a natural time for reflection about the past and thinking about the future, and Saintsbury's classic work of literature will encourage all of us to consider how wine culture has changed--and how it has remained the same--since the book was first published in 1920. For those of us who not only love wine, but also write about it, Saintsbury's prose will be inspiring. He is a beautiful writer, capable of evoking a world of pleasures and sensations in a single, powerful sentence. He's also a thoughtful writer, and shares his struggles to convey something as mysterious and personal as your taste of a wine with a reader. I'll be eager to read about your experiences with the book. Did you like the history, or did you find reading about how one man drank wine nearly a hundred years ago too remote? If you write your own tasting notes--either for personal use or for publication--do you think that you will write them differently, now that you have read Saintsbury? What will you remember about this book, long after you put it back on your shelf? A particular wine? A particular place that Saintsbury enjoyed a tipple? For those of you who are planners, here is the schedule for the next three months of the WBC. I've used many of the suggestions I received last year, and will continue to plan three months out. That way, we can add newly released books when people are eager to read them, rather than putting them at the end of a long, long queue. If you have additional suggestions--whether new releases or classic titles--please leave them in the comments. We will get to them, I promise. Please send me URL links to your reviews of Saintsbury's book by Wednesday, January 28 so that I can (if necessary) write a round-up post on January 29.